Based on the previously described sign-in process, administrators without a Director in a multiple Front End pool environment face a dilemma of determining which pool should handle the initial sign-in and authentication for all users. The Lync client applications use weighted DNS SRV record lookups to find a pool, and only one pool can be considered the most preferred. When a Director exists, these DNS records typically point at the Director, which then handles sending the user a SIP 301 Redirect message with the primary and backup registrar pool information. Without a Director, one of the Front End pools in the environment must be responsible for handling these tasks for all users. Historically, the Director role played a much bigger part in the sign-in process every single day, and careful planning was required to ensure that there was enough processing capacity available to handle the bulk of sign-in and authentication traffic occurring during the morning hours in each region. The benefit of a dedicated Director from an internal perspective was that these initial authentication requests were offloaded from Front End servers. However, since Office Communications Server 2007 R2, the client applications have maintained a file called endpointconfiguration.cache in the local settings folder of a user’s PC. This file contains the user’s primary pool and preferred server in a pool so that on subsequent sign-in attempts the client will actually attempt to first contact the server in the file before falling back to any DNS SRV record lookups and potentially leveraging a Director. This means that although a Director can certainly offload authentication and sign-in traffic from a Front End pool for a user’s first sign-in, it’s of little benefit internally on later sign-in attempts. The clients are generally bypassing the Director altogether by leveraging their local cache information. Of course, if that cache is removed or fails at some point, the Director will be used again, but many organizations have begun to accept that temporary traffic increase to a Front End pool. Another strong benefit of using a Director is its capability to serve as a barrier between internal pools and external traffic. To understand the benefit here, it is important to know that Edge servers do not authenticate external user requests across the Internet and merely pass this traffic to a next-hop internal server to handle authentication. This means that without a Director all external traffic is being authenticated by a Front End pool, or in other words, anonymous Internet traffic is being allowed to communicate with an internal domain member server. Instead of allowing authentication requests from an Edge server to pass directly to a Front End pool, a Director can be placed in between this communication path and used to authenticate users before external traffic ever reaches a Front End server. This doesn’t change the fact that an internal domain member is accepting unauthenticated traffic, but it does provide some protection for Front End pools because traffic will never get through the Director without being authenticated. A Director can also help simplify the federation and remote access paths for SIP traffic within an organization. Instead of requiring firewall rules for SIP between all Front End pools, a Director pool can be specified as the outbound federation route. This means that all Front End pools send their remote traffic to the Director first, which then communicates with the Edge servers. This scenario is depicted in Figure 2 where the Director stays within the communication path at all times to ensure that the internal pools are protected. This topology also helps with troubleshooting efforts because the signaling path is more predictable, and reduces the number of firewall rules required. A compelling reason to deploy a Director is the fact that it provides some isolation for Front End pools from the Edge servers and Internet. If there was a denial-of-service attack against the Edge servers, only the Edge servers and the Director would be affected. This separation allows the Front End pools to continue operating as normal without being impacted by the attack. If a Director was not deployed as the next hop from an Edge server, an attack could potentially impact a Front End pool and cause a much larger disruption to user services. The final major benefit of a Director is to serve as a terminating point for the simple URLs in an environment, as shown in Figure 3. Simple URLs are web URLs defined within Topology Builder that handle redirects for meetings, dial-in access numbers, and, optionally, the Lync Server Control Panel admin page. Just as with SRV records for sign-in, these URLs each have a single namespace that can be shared globally throughout the organization. 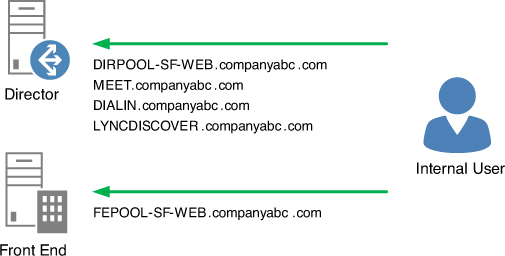 When anonymous users connect to one of these names with a valid request, they are provided a redirect to the correct web services URL for a Front End pool. As with user sign-in, any Front End pool can handle this functionality, but publishing the simple URLs through a Director could be attractive to organizations that don’t allow anonymous remote users to access their Lync infrastructure. Figure 3. Reverse proxy publishing of simple URLs to a Director. As with the simple URLs in an environment, lyncdiscover.domain.com is a hard-coded DNS name that Lync mobile clients use to discover a connection point. Directors are a perfect target for this record because they also run the Autodiscover service within the internal and external IIS websites. Anonymous mobility requests reach the Director, the user is authenticated, and the user then receives a redirect to the web services URL for the primary registrar pool.